This is a regular body wash that does the job well. With eleven different fragrances to choose from, you are bound to find something you like. If you are looking for a good body wash, then this is a good choice. It’s not particularly different from any other body washes out there, but you do get a wide selection of fragrances to choose from. I chose the lavender which is very fragrant, but extremely nice. This body wash hydrates the skin so you can feel moisturized afterwards. This is a good product to try out for all you bath and beauty junkies out there. The texture is fairly thin, but it is not at all runny. It has about the same consistency as liquid soap. When I placed a dab on my arm close to my shoulder, it slowly dripped down my arm. It is completely smooth. There are no grains of sea salt or anything like that in this, so it can’t be used as a scrub. 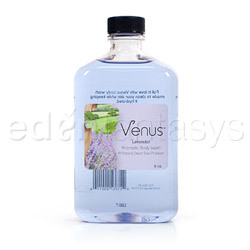 Venus makes a body scrub if you are interested. This isn’t edible, but the lavender scent is amazing. The scent is very strong, so if you don’t like lavender all that much, you would probably get a headache from this scent. If you like lighter fragrances, then you might be interested in the milk or cucumber melon, and there is also an unscented one if nothing appeals to you. A quarter sized drop lathers wonderfully with a loofah. That is enough to cover my entire body. It rinses off very easily, so you’ll want to lather up out of the direct stream of water. The scent doesn’t really linger on my skin afterwards, but that’s ok, I just use body butter or another lotion. I didn’t experience any irritation after using it, but if you are concerned about parabens, then you won’t want to use this. Only use this externally as the fragrances and other ingredients may irritate your sensitive tissues. This comes in an 8 ounce bottle with a twist off cap. A pump top or even a flip cap would work better in this situation so you don’t have to juggle so many different things. The bottle just looks like a normal body wash, and I haven’t had any trouble with it leaking. This was a decent body wash to use. It was a little thinner than others I've used and therefore doesn't lather up as well, but the lavender scent was very refreshing. It would be nicer if this came in a larger bottle, but overall this was pleasant to use. Oh no, twist off cap! Nice review. Thank you for viewing Body wash – soap review page!